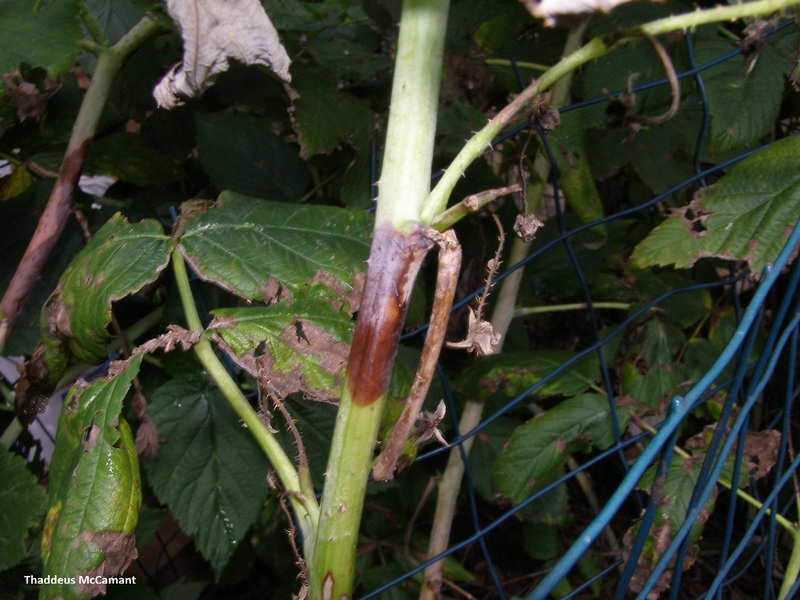 Raspberry spur blight is caused by the fungus Didymella applanata. All species of Rubus are susceptible to spur blight, but red raspberries are particularly sensitive. It is believed to have no other hosts. Infection occurs in early spring and is favored by wet weather. In spring, spores (both ascospores and conidia) are released from tiny, black, round fruiting bodies. The spores are carried by wind or splashed by rain onto the leaves, where they germinate. The fungus infects leaves and grows down the petiole and into the cane, where it forms a lesion. Fruiting bodies may be observed in fall. The fungus survives the winter in infected plant tissue and crop debris. Disease can be especially severe in years when there is abundant rain in early summer. Symptoms appear in summer. Leaf lesions are brown with yellow margins and often V-shaped. Infected leaves may shrivel and drop, but the petiole is left behind on the cane. Mature leaves are more susceptible to infection than young leaves, and so disease usually begins on the lower third of the cane. Dark brown to purplish lesions form just below axillary buds. Lesions are fairly superficial and the fungus does not invade the vascular system. In late fall or the following spring the epidermis over the lesion may split, and fruiting bodies may be visible. Overwintering lesions may turn silver or gray. Infected buds often fail to survive the winter, or will produce weak shoots in the spring. Bud failure is more severe in years when temperatures remain warm into late fall. Spur blight may be mistaken for winter injury. Proper cane spacing and weed control will maximize sun exposure and air flow and facilitate drying of canes. Do not work with canes in wet weather. Avoid overhead irrigation, as it soaks the foliage and contributes to splash dispersal of spores. Sanitation is crucial, as the fungus overwinters in infected plant material. Remove spent floricanes after harvest. Remove any infected primocanes and burn or bury them. Complete pruning well before new canes emerge in spring. 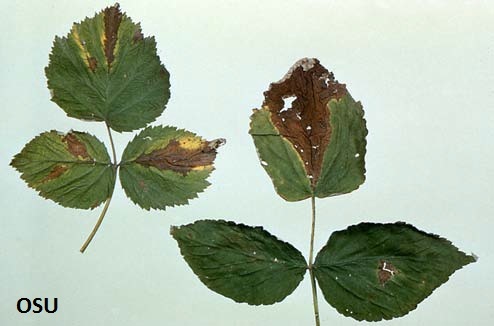 No varieties of Rubus are truly resistant to spur blight, but some cultivars are less prone to the disease than others. These include “Brandywine’, ‘Festival’, ‘Hilton’, ‘Killarney’, ‘Latham’, ‘Madawaska’, and ‘Newburgh’. Avoid excess nitrogen. Spur blight is most severe in overgrown plantings. Stressed plants are more susceptible to diseases. Control insect pests such as borers and maggots. Proper fertilization and irrigation also help prevent plant stress. An application of lime sulfur before growth resumes in spring can decrease disease incidence. A preventive fungicide application may be desirable after pruning if the planting has a history of spur blight. This work was supported by the Crop Protection and Pest Management Extension Implementation Program, Grant No. 2014-70006-22579 from the USDA-National Institute of Food and Agriculture.